North Dallas Aviation came to us interested in making some modifications to an existing website and changing their hosting provider because the website was running slow and laggish. Upon looking at what they had and the reasons why the website was so slow, they decided on ditching the old website and having us design and develop a new website for them . We started by creating a custom designed website concept for them, then developing the website within the WordPress Content Management System, to allow them to easily manage and make updates or changes to the website. We built the new website utilizing responsive web design so that the website displays correctly on any device and in any browser. We also incorporated a number of plugins and made numerous programming modifications to extend functionality of the website and provide additional features. Lastly, we optimized the website and content to perform well in Search Engines and for web pages to load as quickly as possible. GTmetrix is popular website that analyses website performance and speed. The image below is a screen capture showing the performance score and page load speed for the North Dallas Aviation website. 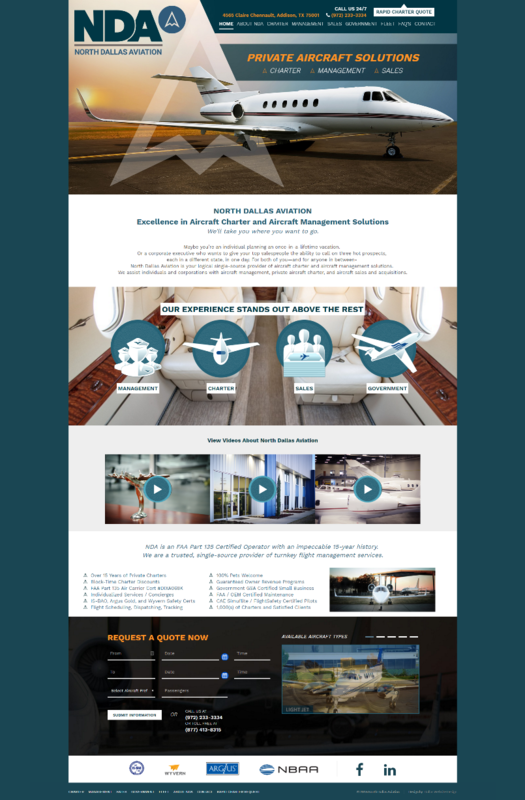 The end result is North Dallas Aviation has a better looking website, better performing website, a website they can be proud of, and are very happy with Dallas Website Design.